In 2011, in a small, hot, windowless room in Rio de Janeiro, a small team of scientists and engineers invented a new way to make medicines. Working in the biopharmaceuticals industry, Johan Rosenquist saw a problem. Biopharmaceuticals, also called biologics, are the world’s fastest-growing class of medicines, helping to fight against some of the world’s toughest diseases. They are protein-based drugs that are isolated from natural sources—mostly microorganisms like bacteria and mammalian cells. The problem Johan saw was that biologics are typically expensive to make, in complex manufacturing facilities that take years to build, and are often prohibitively expensive for huge numbers of patients around the world. 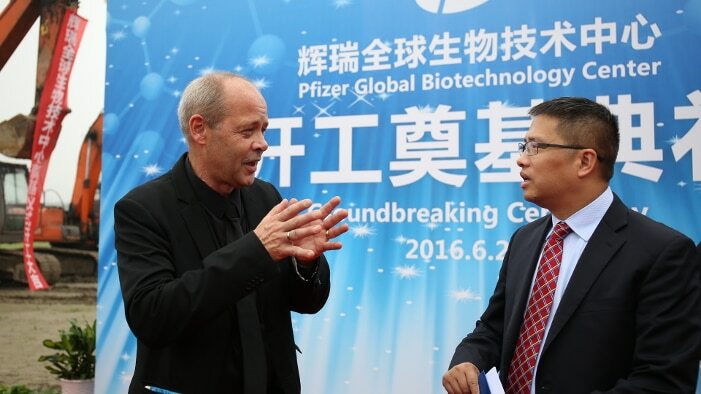 Johan Rosenquist (left) at a press conference on Tuesday together with Qing Li, General Manager, GE Healthcare Life Sciences, Greater China for the announcement of the Global Biotechnology Center in Hangzhou, China. The center will be equipped with KUBio facilities based on flexible, single-use bio-manufacturing technology. 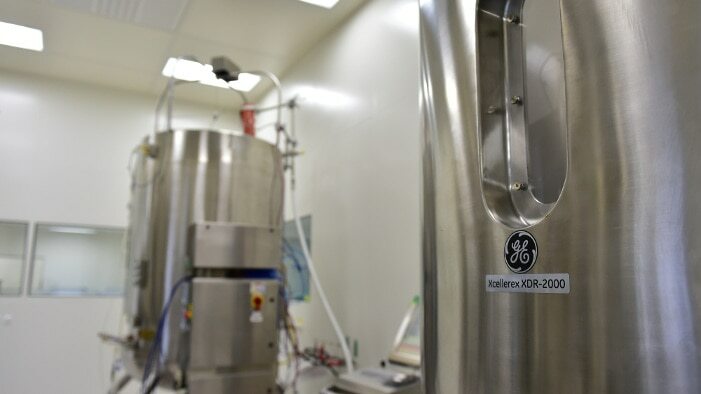 Above, bioreactors used to make biologics. Of the top ten therapeutics on the market today, seven are biopharmaceuticals, and these drugs are about to become even more commonplace — more than 5,000 biologic drug candidate products are in research and development. The global market for these medicines is more than $170 billion and is growing fifteen to eighteen percent annually. Biologics include synthetic insulin as well as medicines that battle rheumatoid arthritis, cancer and other diseases. Johan and his colleagues started refining this idea and finally got everything down on paper in their meeting in Rio de Janeiro. Four central principles guided them in their work: flexibility, short time-to-production, ensured global regulatory compliance and known and fixed investment from the start. They found someone who could help them build a standardized, modular facility that would be easy to put together and could be set up anywhere. KUBio™ was launched a year later. Labs ready for shipment: KUBio modules being loaded for shipment to Wuhan, China. KUBio™ is the factory-in-a-box with a complete turnkey approach, including construction and transportation to a customer’s site, manufacturing process optimization, validation of the facility and training of customers’ manufacturing professionals that solve many of the problems Johan saw in biopharmaceutical manufacturing. 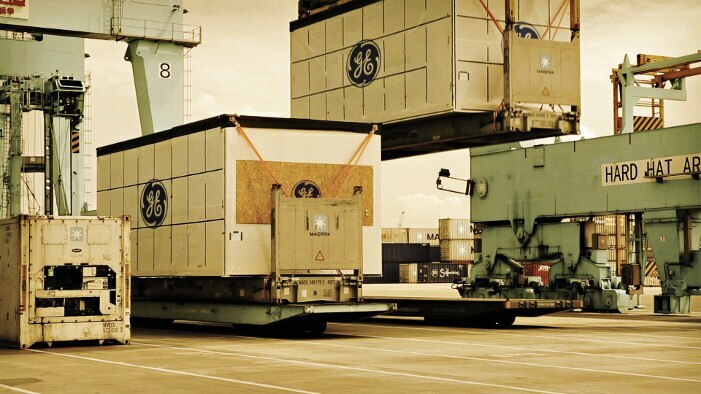 The pre-fabricated facility arrives in modules that are 80 to 90 percent pre-equipped; units include heating, ventilation and air handling systems, clean rooms, most of the utility equipment and all of the technical installations and piping needed to run the plant, as well as the actual production platform for biopharmaceuticals, FlexFactory. KUBio is being seen as a way to open up the biologics market to the world. In just a few years, the modular pre-fab facility has gone from an idea to a fully functional production facility in China, and will be included in a groundbreaking biotechnology center, also in China. Talks are underway for opportunities in such countries as Brazil, Mexico, South Korea and Saudi Arabia, among other places.